Mario's forward tilt in Brawl. 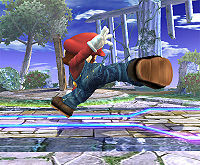 A tilt attack (officially strong attack/強攻撃 prior to Ultimate, referred to as power attack in the How to Play video of SSB), or known simply as tilt, is a ground attack performed by lightly pushing and holding, or "tilting", the Control stick or D-pad in a direction and pressing the attack button, without smashing it as for a smash attack. The easiest way to perform a tilt attack is to press the attack button while walking or crouching. Like smash attacks, there are three tilt attacks: a forward tilt, an up tilt, and a down tilt. Some forward tilts can be angled. Tilts typically have good range and weak knockback at low percentages, keeping opponents in place for follow-up attacks. Many tilts are used at mid-range percentages to keep opponents at a distance. Most have enough knockback scaling to KO at very high percentages, and can be effectively used as such in Sudden Death, although they are otherwise unable to KO at realistic percentages in comparison to most aerial attacks or smash attacks, with only a few such as Falco's down tilt and Ike's forward tilt being able to do so. They tend to also come out quickly, though they generally have more cooldown than neutral attacks. Although the name "tilt attack" was not official at the time, it was used for some trophy descriptions of Wii Fit Trainer in the North American localization of Super Smash Bros. 4. This page was last edited on December 15, 2018, at 12:13.